Before TCC, one restaurant had an average of 3,934 visits per week TCC set up a special promotional program. Visits jumped to 13,924 and sales grew from $129,700 to $464,900. In addition, sales per visit increased by an average of almost $2.00. How did they do it? Years ago, TCC began with birthday and anniversary cards. They had dramatic results. For one 25-unit steak and seafood company, they offered a $10 birthday discount to 215,600 customers who filled out a birthday club registration card. A database was created from these registrations. The birthday card mailings, over a year, cost $90,000. 41.1% of the cards were redeemed, producing overall sales of $2.9 million dollars. Each birthday patron brought an average of 1.8 other guests for the party who paid full price. Flush with the success of the birthday programs, TCC created permanent Frequent Diner membership cards for restaurant patrons. In June 12, 1998, for example, TCC mailed out 24,725 permanent plastic cards for a restaurant chain. During the week before the cards went out, these patrons visited the restaurants 1,050 times. During the 13 weeks after receiving their permanent plastic cards, these patrons visited an average of 1,400 times per week – an increase of 33%. They spent $156,000 more than they were spending before the cards were mailed. The next step above birthday and membership programs, of course, is points. Everyone likes to accumulate miles or points whenever their shop. Restaurant patrons are like everyone else. TCC set up an on-line real time frequency program that links a point of sale terminal and TCC computers. The process is just like a credit card verification. Whenever a member presents his plastic membership card, it is swiped through the terminal which dials the TCC 800 number. TCC’s computers post the transaction, and send back information that is printed on the member’s transaction receipt. The information includes the member’s up to the minute point balance, along with offers, rewards and messages tailored to the individual’s past frequency and purchase behavior. Gift certificates. These are similar to a pre-paid phone card. When a patron presents a gift certificate, it is swiped through the terminal and the meal is charged to the card. The certificate data is stored on the TCC computer, so if the card is lost, the card can be reconstructed. Cash balances can be increased. Specific menu items can be tracked. This provides the restaurant with expanded marketing flexibility for special promotion creation. It has been used for a continuity program for tracking the tasting of a variety of beers. Pre-meal offers can be issued. By swiping the member’s card before he orders, he can get bonus points or special discounts on particular appetizers or desserts which might not otherwise be ordered. Reception areas can have terminals. While they wait to eat, members can swipe their own cards to get up to the minute account information. This can be an opportunity for promotional messages, incentive purchase coupons or announcements of future events or upcoming promotions. Guests are invited to “join the club” at participating restaurants. The registration card may include many family members with their birthdays. The form may solicit other information such as business address, dining behavior, demographics or customer satisfaction evaluation. The forms include a perforated temporary membership card which can be used immediately. The permanent plastic card with the magstripe is mailed to each member within a week. If a member shows up without his card, the transaction can be entered manually so that he gets full credit for his purchases. Communicating the up-to-the-minute point balances to members eliminates the previous cost and need for mailing monthly statements. This reduces the overall program costs significantly. A portion of this savings can be applied to generate additional bottom line revenue through special targeted mailings. For example, it is often extremely effective and profitable to mail a post card with a moderate incentive offer to members who have not dined in the past 90 days, to reactivate them. TCC also provides a telephone service to answer member’s inquiry calls on an 800 number. This member service is a value-added marketing opportunity permitting special personal messages to each caller, reflecting her current dining history and preferences. The point system includes nightly, weekly and monthly reports by server, customer, customer segment, gift certificates, special offers, etc. A restaurant chain wanted to increase frequency and reactive members who seemed to be “drifting away.” TCC selected 4,000 members who had not earned any points during the previous three months. They sent them a letter offering a $5 discount on dinner. The offer was good for 35 days. The letter cost $1,800. What were the results? Average member visits went from 25 per day before the promotion, to 42 per day during the promotion, and 29 per day in the 35-day period after the promotion was over. Average visits per card went from 1.18 before to 1.26 during and 1.22 after the promotion. Incremental sales were $17,100 during the promotion and $4,700 in the 35 days after the promotion was over. In other words, by spending $1,800, this restaurant chain reactivated 599 people who were otherwise lost as patrons. The gain was not only during the promotion period, but had a lasting effect, with 147 of the reactivated people visiting the restaurant after the promotion was over. Relationship building works and has lasting benefits. 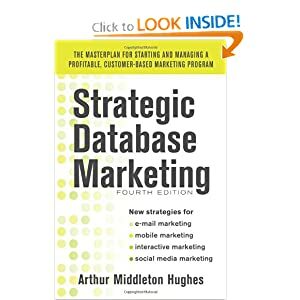 Database marketing is gradually catching on in a variety of industries. Day by day we see hundreds of different businesses building their databases and finding innovative ways of building relationships with their customers that are satisfying for the customers and profitable for the companies. It is refreshing to see the proof of its success so clearly demonstrated as it is in this case by The Customer Connection.